GVL / Archive Student puts out a cigarette outside of the Connection Commons on Saturday November 14, 2014. Grand Valley State University is just one of two public institutions in Michigan that has yet to go tobacco-free. In late March, GVSU student senate voted against supporting a proposal that would implement a tobacco ban on the university's campuses. The proposed ban wasn't just limited to traditional cigarettes: Vaporizers and e-cigarettes also fell under the proposal. Despite the proposal falling short at senate, representatives from Campus Recreation and other GVSU departments are still pushing to make GVSU a smoke-free campus. Their goal: not to punish smokers, but to push healthier lifestyles for students, faculty and staff. Amy Campbell, associate director of Campus Recreation, and Lindsey DesArmo, health and wellness manager for Human Resources, spoke to senate about the proposal. Despite the vote falling short at senate, they still hope to garner more student support in the upcoming academic year. "It was a risk we took," Campbell said. "But at least we got the conversation going, and I think it's a good thing that students are talking about it." The early draft of Campbell and DesArmo's policy earned support from GVSU Provost and Executive Vice President for Academic and Student Affairs Maria Cimitile, Acting Vice Provost for Student Affairs and Dean of Students Stephen Glass, the athletic department, Admissions Office, Housing and Residence Life, the University Counseling Center, the College of Health Professions and the GVSU Police Department. The GVSU Wellness Task Force, which consists of 19 different GVSU and GVSU-affiliated departments, supported the early draft as well. With strong support from various departments, Campbell and DesArmo thought of presenting their proposal directly to university administration. Yet, student support remains a vital part of the proposal. "We wanted to make sure to have (student) representation," DesArmo said. "I feel like having more of that engagement will make a more successful delivery of this." "I think we could have presented to administration," Campbell said. "And that was a decision we made, that we wanted to have student senate support first. It's important to us, and we value the students." 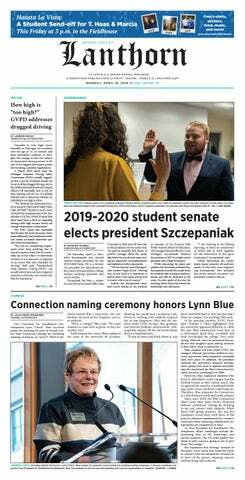 Student senate president Jonathan Bowman cited a lack of time to properly discuss the proposal as reasoning for its failure to pass through senate. Senate president-elect Rachel Jenkin spoke of working toward a solution together. "We're obviously willing to work with any administration on any issue," Jenkin said. "But we also want to make sure that we're not just dropping into saying that we want a policy just because it sounds good. We want to make sure if we're going to have a policy that it's something that students are going to follow." Jenkin also alluded to providing resources for students who do smoke and use tobacco products on campus. The proposal has a timeline for implementation that would allow a buffer year before the ban would take place. In that time, the university would offer resources and information on quitting smoking. DesArmo and Campbell's proposal to senate listed Aug. 1, 2019, as an implementation date. Had the proposal passed, the bulk of the 2018-19 academic year would have been spent educating students on the proposed changes. Campbell and DesArmo even administered a survey of GVSU students, which received more than 1,400 respondents. In the survey, 80 percent said they had never used cigarettes, while another 74 percent said they had never used e-cigarettes. E-cigs and vaping are newer trends for smoking. They, too, would be prohibited under the ban. DesArmo explained that vapes still pose a public health risk, even if they are not as stigmatized as traditional cigarettes. "There are chemicals. There's nicotine in (vapes)," she said. "We don't know everything that's in it because they can put whatever, which would be concerning to me, as I'm taking this in to my body, like I don't know what's in it." The survey also found that GVSU students are using e-cigs at a rate 10-percent higher than the national average. As Campbell, DesArmo and the rest of the GVSU Wellness Task Force continue to look for solutions to the issue, they maintain that student involvement and support is vital to the cause. "We need that voice," DesArmo said. Campbell hopes students can get involved so that when the proposal is taken back to student senate, the case will be even stronger. Those interested in working with GVSU Wellness can reach Campbell at campbamy@gvsu.edu.